If people are looking for a few little miracles, look no further than St. Vincent de Paul Society's new Thrift Store location at 1645 Third Ave, which holds its grand opening Friday and Saturday from 10 a.m. to 4:30 p.m.
Take a step inside to see the brightly painted walls, the lovely floors, not to mention all the donated items available for sale or gifted to those in need. Prince George community members are being invited to participate in a Good Neighbour Food Drive to help the community of McBride. On April 5th a fire destroyed a cedar mill, one of the main employers in McBride, causing suffering for many in the community. If you can help, please bring nonperishable items to one of the four Catholic parishes in PG before or after Mass on the weekend of May 21st. 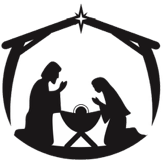 St Vincent de Paul is looking after collecting the nonperishable items on Monday the 22nd and delivering them to McBride that day. As well as needing food items, help will also be needed at each parish on the Monday to load the truck. Monetary donations will be accepted. perishable items. Let's see if we can meet that goal again. There's a new thrift shop in store for the St. Vincent de Paul Society. The local non-profit that provides meals 365 days a year to those in need at the Drop In Centre in the downtown core of Prince George needed a bigger space for the thrift shop and after a two-year search founda new location. St Vincent de Paul urgently needs volunteers for our Easter Dinner, April 16th, at Sacred Heart Auditorium. For the success of the dinner, 50 volunteers are required from 10:15 am to 2:00 pm. 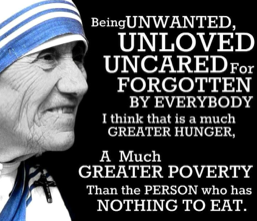 Please consider sharing your Easter Sunday with those less fortunate. To ensure we have enough volunteers, it is imperative that you register by calling the Drop-In Centre at 250-564-7871 between 9 am and 4 pm, Monday through Thursday. Donations of fruit pies would be very much appreciated. They can be dropped off at the Drop-In Centre [1220 - 2nd Avenue] up to Thursday, April 13th at 4:00 pm. Please wrap and label the pies beforehand. the peoples of the Arctic and the North of 60 Project became a National initiative. Happy St Louise de Marillac Feast Day! It's a common sight at a city intersection. A man or a woman holds a cardboard sign: "Homeloess, Hungry. Please Give. Anything Helps." Most motorists, stopped at the light and eager ot move on, just ignore the person. Bur what should you do before the light changes? We are entering ou busiest time of the year and would not be able to carry out our work without the gift of volunteers and their time. If you are able to help with any of the following please register by phoning the Drop-In Centre, Monday to Friday, 9:00 am - 4:00 pm, at 250 - 564-7871. The first conference of the Society of Saint Vincent de Paul in Canada was founded on November 12, 1846, coming to life at the cathedral, in the city of Québec. Ever since the Society has continued to expad across the coutry and today, we are present from coast to coast. In spite of parish closures and amalgamations, the number of our conferences in increasing and we ontinue [to] recruit new volunteers. A chance encounter inspired a local kid to make a postive change. Jayden Wong, a Grade 3 student from Westwood elementary, helped deliver around 200 pounds of food to the St. Vincent de Paul Society Friday morning. He also brought eight bags of blankets, warm winter clothing and more than $300 - all with the hope of helping the local homeless population. St Vincent de Paul will host a Thanksgiving Dinner for those who would not otherise have one at Sacred Heart Cathedral Hall on Sunday, October 9, 2016. Dinner will be served from 11:30 - 1:15 pm. Almost every day for the last 10 years there's a familiar face that can be seen at St. Vincent de Paul Society's Drop-In Centre on Second Ave.
St Vincent's Thrift Store welomes your donations of clothing, home furnishings, appliances, toys, crafts, etc. Let's go! The entire Vincentian Family prepares to celebrate the 400th anniversary of the birth of the Vincentian charism that will take place throughout the year 2017. Together we can make life easier for our neighbours. Clean-up help is needed in the kitchen at the Drop-in Centre. If you are available to help during weekday afternoons, please contact the Drop-in Coordinator, at 250-564-7871 or come in to the Drop-in Centre to get further information. 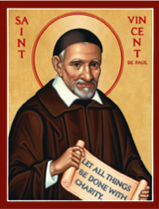 The SSVP is under the patronage of Saint Vincent de Paul, it draws its inspiration from his thoughts and his works. Members strive, in a spirit of justice, charity, mutual help, and solidarity with the poor, and by personal commitment, to ease the hardships of those who suffer. Our monthly Conference Meetings will be held on the 2nd Saturday of each month following morning Mass. in the downstairs meeting room. Conference Meetings will focus on the spiritual aspect of being a Vincentian and have a minimum amount of time spent of the business side of the Society. Meetings will be limited to one hour. Please join us. St Vincent de Paul will be holding their annual Community Easter Dinner on Easter Sunday, April 21 at Sacred Heart Auditorium on Ingledew Street behind the Cathedral. Volunteers are needed from 10:15 am to 2:00 pm to help serve food and clean-up. Please consider sharing your Easter Sunday with those less fortunate. To ensure we have enough volunteers, it is imperative that you register by calling the Drop-In Centre weekdays between 9 am and 4 pm at 250-564-7871 or 250-564-7836. Donations of fruit pies would be very much appreciated. They can be dropped off at the Drop-In Centre [1220 - 2nd Avenue] up to Thursday, April 18th at 4:00 pm. Please wrap and label the pies beforehand.